Exclusive to TALON Wind Turbines from A&C Green Energy. What is Variable Pitch Technology? This is an advanced technology that, up until NOW, was only available on those huge megawatt systems you might find in major wind farms. Easily stated, this system enables the wind turbine to maintain a constant peak output during times of higher wind. How does Variable Pitch Technology work? Each of the Talon's 3 blades have an attached centrifugal hammer that calculates when the generator is turning too quickly. Each blade is then automatically pitched to control the generator rotation speed. Why is Variable Pitch Technology important? When another wind turbine reaches its peak power (usually in high wind speeds around 25-30 mph), there is a decline in the power output curve mostly because of either blade design or tail furling. Instead of a decline in power output with increasing wind speeds, the Talon series maintains its maximum power output up to winds of 56 mph, its top working speed. What does all this mean? With the increased power output from the Talon wind turbine, you will have more energy to use and more energy bill savings, which means you can afford to leave your new HDTV on all month long! Vertical Axis Wind Turbines (VAWT) - These turbines spin around like a record and have their axis running up and down. These systems are good in urban areas where there is a limited amount of space. The drawback to these systems is that the oncoming wind pushes on both sides of the blades, creating an issue of excess drag and decreased performance. Horizontal Axis Wind Turbines (HAWT) - Like most wind turbines and windmills. This design has been relatively untouched for centuries. Whether considering the windmills of Holland or the old windmills on the prairies of West Texas, these systems have been the most productive of all. There are essentially two types of HAWT: Upwind and Downwind. Upwind HAWT - Upwind systems are the most common of the "small wind" market, which is reserved for generators that range in output power of up to 50kW. To face into the wind, these systems incorporate a tail vain, which in many cases, as in our PowerMax+ 20K and PowerMax+ 25K units, automatically adjusts to the angle of the wind to limit overspeed rotation. Downwind HAWT - Facing away from the wind and without a tail, these systems are usually what appear in large-wind megawatt wind farms. Simply put, tail-furling and upwind systems lose power during high winds. This decrease in productivity is caused when the blades spin so fast that the oncoming wind meets a "wall of blades" and cannot pass through the blades to create the drag necessary to rotate the shaft with any efficiency. 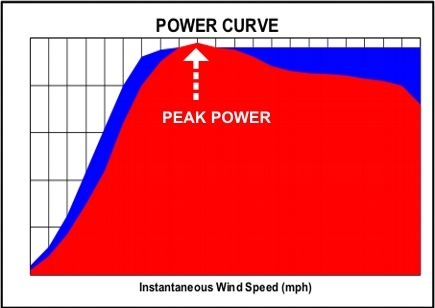 The result is a dramatic reduction on the power curve after the upwind system reaches its peak power. Mimicking the pitching blades of the megawatt turbines, the Talon series from A&C Green Energy reaches its peak power quickly and then maintains the peak output up to 56 mph. 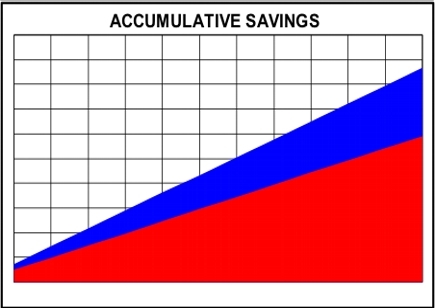 In the graph below, the Talon is represented by the BLUE curve, while the RED curve is from a typical upwind system of the "same" rated output. Because of Variable Pitch Technology, the Talon produces higher wattage output at any given wind, reaches its peak power in lower wind and is able to sustain that peak output in higher winds. This increased wattage output means higher energy production. Higher energy production means more energy savings and more money for you. The longer your Talon is in service, the more money you will earn over a similar upwind system. When the wind speed is below 7 mph (3m/s), the turbine blade angle remains static and the angle (X1) formed between the blade and turbine plane is B° (X1=B°). This is the ideal angle for the blades to begin their rotation. As long as the wind speed reaches 7 mph, the blades will begin to rotate. While rotating, the outermost edge of the blade will be driven by the centrifugal force generated by the rotation of the blade to tilt toward the turbine plane. As the wind speed increases, the blade angle (X1) will then decrease to 0° so that the blade is parallel with the turbine plane. At this angle, the turbine has nearly reached its rated output power. When the wind speed is between 20 mph - 55 mph (9m/s - 25m/s), the blade angle (X1) will stay near 0° with slight fluctuations in order to maintain it’s rated power. When the wind speed is between 55 mph - 112 mph (25m/s - 50m/s), the wind will draw the blade by the centrifugal force, so the angle (X1) will continue to decrease to a negative angle (X1 = -B°) [B° and -B° are not the same]. Under this negative angle, the blade angle will produce a resistance on the rotation of turbine blades to slow down the turbine, thus protecting it from over speed operation. The maximum rotation of the turbine will be no more than 380 RPM.